The full extent of the looming climate catastrophe is becoming ever clearer. A batch of scientific reports released in the last few months make for shocking reading. According to a study by the US National Academy of Sciences CO2 emissions have increased by 3 per cent a year this decade, compared with 1.1 per cent a year during the 1990s. This is much higher than figures included in the report by the Intergovernmental Panel on Climate Change (IPCC). The University of California’s National Snow and Ice Data Center has completed research which shows that Artic ice is melting rapidly, declining by 7.8 per cent a decade over the past 50 years. Much worse than the average estimate by IPCC computer models of 2.5 per cent. This new research reveals that the world doesn’t have the luxury of 30 or 40 years to cut back greenhouse gas emissions. The threat is urgent right now. As the report by NASA and the Columbia University Earth Institute makes clear, “moderate additional” greenhouse emissions are likely to send the earth’s delicate eco-system past “critical tipping points”, which will lead to irreversible climate change with disastrous consequences for life on the planet. In what is quite simple science, the NASA report highlights the runaway climate change momentum of melting ice. The frozen parts of the planet currently reflect sunlight back into space, but as the sheets of ice melt liquid water forms on the surface, which being darker does not reflect heat. Rather it absorbs it, making the earth hotter, which melts more ice, and so on and so on. In Greenland and West Antarctica water is already forming pools on the surface of these massive ice sheets. That water will also be trickling down through ice -sheets, breaking them up and causing the ice to slide into the ocean. 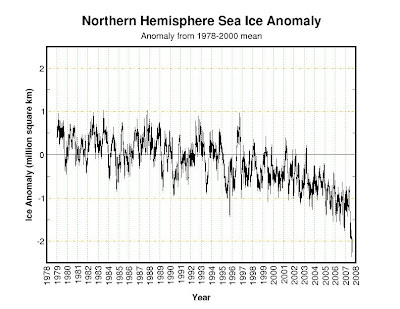 Once ice falls into warmer sea water it quickly melts. As the ice retreats back towards the North and South poles there is more dark ocean and dark ground uncovered. The NASA report notes that dark forests are expanding northwards towards the Artic, replacing lighter snow cove red tundra, again reducing the amount of frozen ice and snow that reflects the suns rays. At some point this process will be unstoppable, leading to the disappearance of the massive ice sheets in the Artic and Antarctic. The result will be rapid sea-level rises of 20 metres or more in less than a century, which would be catastrophic to human populations. James Hanson, who led the NASA team, says we have less than ten years to drastically cut greenhouse emissions before it’s too late. The same thing is happening in New Zealand. The two major parties, Labour and National, are leading us to catastrophe, for the same reason as the British government . They don’t want to upset big business, who refuse to have their profits affected by the urgent measures needed to cut greenhouse gas emissions. Corporate heads and pro-business lobby groups have been delivering a strong message to the government: don’t touch our profits. On National Radio, Federated Farmers of New Zealand president Charlie Pedersen, argued that New Zealand shouldn’t do anything about climate change, because our output of CO2 is a small percentage of global output and to limit emissions will cripple the competitiveness of farmers. The farming lobby has warned the government off doing anything to curb methane emissions from farm animals, which accounts for half of New Zealand’s greenhouse gas emissions. Hence, Clark & Co are keeping their noses covered to the smell of 25 million tonnes of methane belching into the atmosphere each year (one tonne of methane has the same atmospheric warming potential as 21 tonnes of CO2). The mainstreaming of climate concern is, however, forcing governments around the world to give the appearance of doing something. Labour, after some half-hearted flirtation with emissions taxes, is now riding the carbon trading wave that’s being propelled by corporate bosses and neo-liberal politicians globally. Carbon trading is part of an ideological struggle to maintain the hegemony of the “free market”. Capitalists don’t want public solutions that make social, economic and environmental sense – like free and frequent buses – catching on. 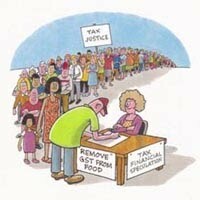 This would undermine the whole ethos of privatisation and corporate competition. Labour has been going along with everything else business wants, they’re not going to go head-to-head with powerful corporate interests over climate change. So they’re embracing carbon trading as something they can sell to New Zealand people, but which won’t harm their partnership with big business. Labour is already working with Australia’s Howard government to set up a trans-Tasman emissions trading scheme. The Australia-NZ trading scheme will be compatible with international emissions trading. One task of the closed-door meetings between government officials and trans-Tasman bosses will be to decide at what level emissions are “capped”. When carbon trading was introduced in Europe corporations put pressure on market regulators to keep the cap high. This meant that some companies were already under the cap and were immediately able to start selling their “carbon credits”. Businesses were handed million dollar windfall profits for doing nothing. Unsurprising carbon trading in Europe has not reduced emissions, which have continued to rise since the scheme was introduced in 2005. The threat of catastrophic climate change is sharpening the divisions between “left” and “right”. Labour’s gone with the capitalists. Any measures they introduce will be minor and ultimately ineffective. It’s no good taking an aspirin when you’re having a heart attack, urgent critical intervention is required. With the planet in the early stages of cardiac arrest there’s no time to stuff around with small measures that won’t change the course of events. Otherwise the patient dies. The rightwards policy direction is one outcome of the Greens’ long-term focus on parliament. The goal of getting seats around the cabinet table has neutralised the Green Party’s activist base and the party has become increasingly distant from the grassroots movement. Despite being shafted at the last election, the Greens leadership is still looking to secure a political alliance with Labour. This means being “reasonable”, “responsible” and “ready to govern” – all these conservative phrases translate into accepting the status quo and not rocking the boat. 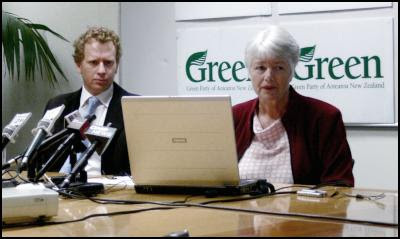 So Jeanette Fitzsimons , the Greens’ other co-leader, was all smiles when Labour announced a few extra million dollars would be spent on promoting solar energy for homes. With a rapidly approaching tipping point for irreversible climate change this is but a drop in a rising ocean. A fact recognized by Green Party members on their blogsite. The leadership has a hard time selling these few crumbs to grassroots members. The extent of the political crisis within the Greens has seen some in the leadership openly talk about a coalition with National. Fitzsimons says they want to “leave the door open”. She claims the Greens are beyond “left” and “right”. 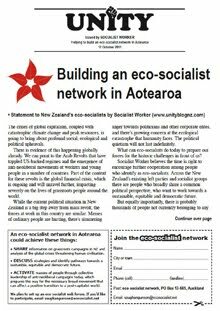 Some in the party are arguing that to make itself attractive to National as a potential coalition partner, the Greens should ditch their social policies and just concentrate on environmental issues. But the same people who want to crush workers, cut public services and slash welfare are the same ones who would continue to destroy the environment rather than have their profits checked. And how can a party hope to win the support of the grassroots majority if they’re not going to fight for other things that concern grassroots people, like decent pay, union rights, free healthcare, livable benefits, etc.? The measures needed to urgently cut greenhouse gas emissions will see business up in arms – that’s unavoidable. Getting serious about climate change will mean standing up to big business and their political representatives in parliament and on local body councils. What’s required is leadership that’s prepared to tell it like it is and win the “battle of ideas”. This isn’t the political path the Greens are on. The leadership seems to be in the grip of a new kind of climate change denial, one where they think they can continue to play politics with the pro-market parties, Labour and National. 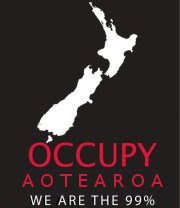 In the process they’re putting themselves to the right of the movement that’s emerging around the climate change issue. Is carbon trading the indulgences of the 21st century? Martin Luther, a 16th century church professor at Wittenburg Catholic University, was troubled. The citizens of Wittenberg, many of whom belonged to Luther’s flock, were in the habit of seeking forgiveness of sins by purchasing indulgences. Luther had previously already preached in condemnation of indulgences. On Halloween, the Eve of All Saints, in 1516, he spoke out, drawing everyone's attention to his revolutionary view that the Pope could not free souls from purgatory. He condemned the very idea that money payments could wash away sins as pernicious. Logically it simply meant that the wealthy could sin with impunity. Martin Luther couragously did this despite the fact that the Castle Church at Wittenburg, and even the university where he was employed , were both dependent to a large extent on this lucrative source of revenue.